Comicbook. 24 pages. A5 size. B/W interior. Comprising two stories of fantasy and science-fantasy with an emphasis on horror. The surreal action sci-fi story, "Ms Femismo", in which a militant officer battles in a land besieged by a myriad of bizarre hybrids and evolutionary descendants of genetic experiments, a product of religious fanatics. 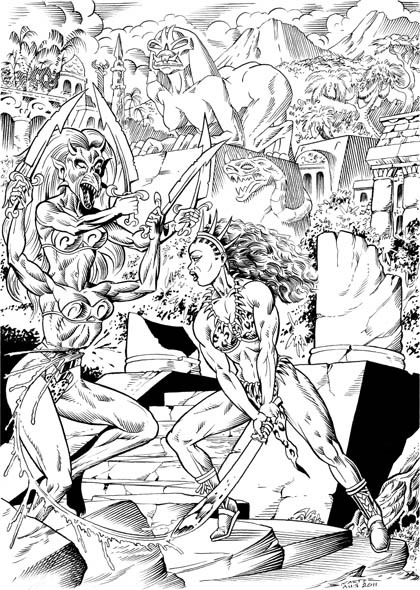 The sci-fi adventure fantasy story, “Amazulu” in which a lone explorer becomes embroiled in a deadly battle between warrior women, zombie amazons and four-armed freaks.